March is when the Maple syrup starts to get serious. Warm days (well we consider it warm) and cold nights = Maple Sap (add heat and you get Maple syrup). The golden hour has added a Autumn look to the woods. This lighting is just stunning. 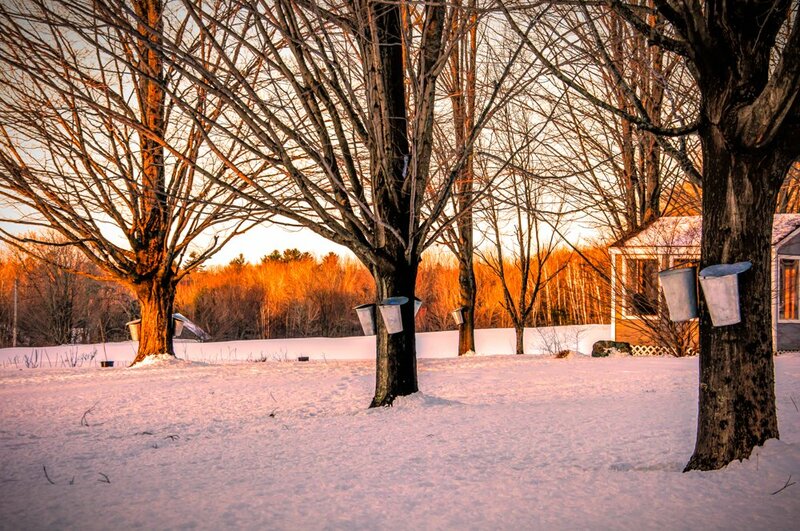 Love this shot with the 3 trees in a diagonal line and sap buckets hanging on them. The golden color is only appropriate for maple syrup. Lovely. I love the story your photo tells! A wonderful capture and golden glow. Great shot! Never seen this before. We hope to see the maple run soon here as well. We were half done last year at this time - and have not even started yet this year! A beautiful scene... love the golden light! Ooooo- I can just about taste that delicious syrup! Beautiful lighting and nice shot. This photo has such beautiful golden lighting! We have one Sugar Maple tree in our yard, but I've never tried to collect the sap for syrup ...This looks quite interesting!